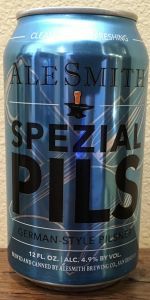 AleSmith Brewing Co. "Spezial Pils"
Pilsner as a style seems to be making a comeback in popularity in America, and offerings like this one from AleSmith are part of the reason why. It's not a big bold beer that's loaded with alcohol, bitterness, and hops or unusual ingredients. To the contrary, it's a basic, very drinkable beer that also offers a good deal of flavor, and thus satisfaction. It's a classic, and really, if we're talking about Czech Pilsner, it's the beer that changed the world of beer back in 1842! Of course this is labeled a German pilsner. It's more southern German than northern in my opinion; and I could argue against it as to why it doesn't exactly fit the German style, but what's the point in that? It's got a very slight haze to its golden body, and it's creamy bright white cap holds fairly well and leaves some nice lacing about the glass as it goes. It could be a little more floral and spicy in the nose, and express "Pilsner malt" more clearly, but it's still clean and welcoming. The same remains true of its flavor, but it's very well balanced if a little malt forward, and it finishes dry and lightly hoppy. Could it be better? Yes, but at the same time it's really quite good, and I assure you, there are pilsners brewed and sold in Germany that are not nearly as good as this one! Straw yellow in color with a light sedimentary haze. There's a fingernail of dishwater white around the rim and over half of the top. The aroma is comprised of grassy German hops and light Saltine cracker-like malt. The taste is as advertised in the nose with perhaps a bit more of the Saltine cracker-like malt than was apparent. The mouth is very light, refreshing, and quaffable. Pours a pretty nice golden yellow color, pretty nice carbonation, with a kinda quick one-finger creamy white head, which leaves some some nice sticky lacing behind. The nose is malty, slight hop, kinda citrusy, slight spice. The taste is not that bad, malty, hoppy, some spice/citrus thing going on. Medium body, ABV not hidden that well. Overall, tasty. Poured out a clear, golden-yellow color with a small, white head of foam. It smelled of grains, toasted caramel and floral notes. Nice sweet flavor with toasted caramel and mild bitterness. A: The beer is relatively clear light yellow in color and has a light amount of visible carbonation. It poured with a short bright white head that quickly died down, leaving a thin layer of bubbles on the surface and a narrow collar around the edge of the glass. S: Light to moderate aromas of floral and grassy hops are present in the nose. T: The taste has balanced flavors of noble hops (floral and grassy flavors) along with bready and grainy malts. There is a slight amount of bitterness. M: It feels light- to medium-bodied and clean on the palate with a moderate amount of carbonation. O: This pilsener has a good balance between the malts and hops. It is very easy to drink. A little too sweet and too hoppy. Seems like it could of lagered a bit more. Does not taste like the cleanest fermentation either or it could of used more time lagering. Expected a better effort from this brewer. Even the carbonation is off. Too flat were it should be lively. AleSmith, like, great brewery. Kind of like going out on a date with Joanna Krupa, you expect the best. But what if she shows up in adidas sweats and Yeezys? It’s like, umm... now don’t get me wrong, Spezial Pils ain’t that bad, but it’s just simply average. Rotten fruit on the nose and tongue... As it warms it actually gets a lot better, but whateva. Poured from a 12 oz can into a Samuel Adams Perfect Pint glass. Canned on 03-21-17 on the bottom of the can. A: Honey-gold with barely a 1-finger nearly white head with average retention and skimpy lacing. T: Flavor is dominated by honey sweetness, sweet bread through the middle to a bit of a fouled off finish, hops but not really enough to get anyone's attention. Hops are spice and floral. Mildly fruit yeast esters -- don't really belong. M: Way too low on the carbonation leads to the beer seeming flabby, light-medium body. O: I hate to downgrade AleSmith products, because they have generally been very good to excellent, but Spezial is a miss, plain and simple. When I drink a German Pils, I ask myself "Would I rather be drinking Bitburger?" In this case the answer is definitely yes. I think a yeast strain change is in order -- this same character has come through in beers with WYeast 2124 Bohemian Lager or White Labs 830 German Lager -- esters don't belong and the beer seems underattenuated. Glad I picked up only a single. Not AleSmith's strongest product. A clear straw yellow with a dense, off-white head with excellent retention and lacing, this looks great. The nose is grainy, dusty, lemony, snappy and with a clean water cracker note, pretty darned perfect, minus the slight sweetness that's also present. The palate opens mildly sweet, moderately buttery, a touch creamy, before a mild hop bitterness takes over. Unlike the nose, the palate is disappointing and disjointed - the delicacy is absent, as is the balance. In its stead is a blend of lemon, honey and a little earth. Sweet on the finish with a moderate earthy bitterness, this beer is medium-light in body, moderately carbonated and is OK. Overall the beer itself seems like it would be good, but they only put half the beer in and water to fill the rest. Seriously, this was like drinking half a beer and half water. I know pilsners well and the parts that hit do it right but just way too light even for a pilsner. Although, still better than the stupid imperial or crazy hopped pilsners that taste like a wheatwine or ipa. 12oz can, drank from the can. Biscuity pilsner grain, grassy earthy hop aroma. Sweeter than expected, with notes of spicy & grassy hops, biscuity pilsner malt, and lager yeast. Lighter body, higher carbonation, finishes sweet with some earthy spiciness from the hops. Decently clean finish but the residual sweetness is off-putting. Overall, it's too sweet for me. It needs a but more sharpness from the hops in my opinion. From the 12 fl. oz. can dated 11/17/17. Sampled on Feb. 19, 2018. The color is a kind of olive-yellow with a long-lasting white head and moderate clarity. On the nose I do get a good toasted sweet malt character, grains, some sweetness, and a little lemonzest and grass. The body is closer to medium than light so that was a nice texture. Tastewise, I am getting a slightly sweet yet slightly biting grainy and malt character. It ends clean and crisp and is easy to drink. I didn't go ga-ga over it but I enjoyed it alright. Appearance: nice light golden hue with a moderate haze and a finger of frothy white foam. A little less murk and a little more head retention would not be unwelcome. Smell: rich, bready malt with plenty of sweetness and a dash of noble hops. Good, if possibly *too* rich for a Pilsner. Taste: bready, sweet malt, like the aroma, but tempered with grassy, noble hops and a richness beyond just the sweetness. It's not strongly bitter, but there's something counteracting the sweet; I think it works very well indeed. Overall: a very interesting and tasty beer. It's not a traditional Pilsner, by any means, but it is a tasty and enjoyable beer. Pours a clear, bright yellow, lots of dense white foam. Smell is a little bit sweet with a nice base of crackery malt. Mouthfeel is smooth, medium bodied, and well carbonated.